The Irish Guards of recent history are very different from the regiment that bore the same name which fought for James II during the Battle of the Boyne in 1690, and later went to France as a 'Stewart' regiment in 1692. The history of the Irish Guards as a regiment of foot guards in the British army only dates from 1900 after its creation was ordered by HM Queen Victoria following suggestions from Lord Wolesley and an Irish MP. Wolesley had recommended that Irish regiments of the British army should be allowed to wear the shamrock in their headress on 17th March (St.Patrick's Day) each year as a mark of the Crown's appreciation of their gallantry during the Boer War, specifically, at the relief of Ladysmith. That suggestion was followed by an Irish MP who tabled a motion in the House of Commons that, as there were already regiments of Scots, Welch and English Guards, a regiment of Irish Foot Guards should also be created. 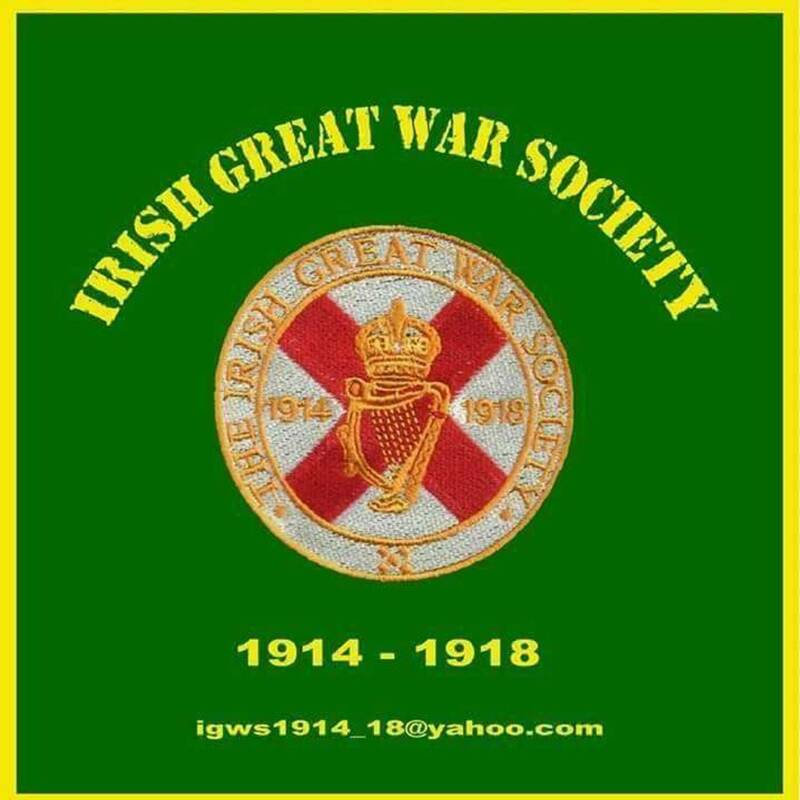 Subsequently the Irish Guards were formed on 1st April 1900 by Order of HM Queen Victoria, although in truth they were just a battalion of foot guards and not a regiment; it took a further 15 years before the Irish Guards truly became a regiment with the forming of its second and reserve battalions. 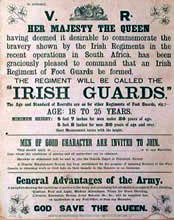 However, as soon as the Irish Guards were established recruitment posters were duly sent out. The Irish Guards' first honorary Colonel was the Anglo-Irish, Indian born Field Marshal Lord Frederick Roberts, widely known to the troopers as 'Bobs'; and it was because of this that the regiment got its first nickname of 'Bob's Own', although they were (and still are) affectionately known as 'the Micks'. No other regiment of foot guards, past or present, has had such a fond and widely accepted nickname. The holder of the Irish Guards' regimental serial number '1' was Colour Sergeant Conroy who was transferred into the regiment from the Royal Munster Fusiliers, and it was his job to to form the new unit. There followed an invitation to all Irishmen serving in other regiments to freely transfer into the Irish Guards and that offer was enthusiastically accepted. Whereas most Irish regiments had specific recruitment areas, the Irish Guards recruited men from all over Ireland and the regiment's first civilian recruit was James O'Brien of Limerick who enlisted on 21st April 1900. The men of the new regiment were presented with their first shamrocks by HRH Princess Alexandra in March 1901 and the following year, two years after the regiment's creation, it proudly received its first colours when they were presented by (the soon to be King) Edward VII in May 1902 at Horse Guards Parade. The Irish Guards adopted a thoroughbred Irish Wolfhound as their mascot for the parade and one has been used for special parades ever since, wearing a specially embroidered coat of livery for such occasions. 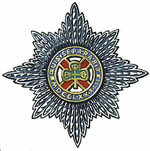 The cap badge of the Irish Guards is the eight pointed star of the 'Most Illustrious Order of St. Patrick'. In the centre is a shamrock embossed on each of its three leaves is the State Imperial Crown of Ireland. Behind the shamrock is the cross of St. Patrick. A roundel encircles the shamrock and cross where below is written the Roman numerals 'MDCCLXXXIII', which reprsents the year the Order was formed (1783), and above are the Latin words, 'QUIS SEPARABIT', which is the regimental motto and translates as; 'WHO SHALL SEPARATE US'. Although a few Irish Guardsmen saw saw action as mounted infantry during the later stages of the Boer War, The Irish Guards as a regiment was stationed at Wellington Barracks, Chelsea in the United Kingdom for the first fourteen years of its existence performing ceremonial duties in London up to the beginning of the First World War. On the 15th July 1915, HM King Edward VII was 'graciously pleased to approve' the formation of two additional battalions of Foot Guards; the 4th Grenadier Guards and the 2nd Irish Guards. The new 2nd Irish Guards Battalion was formed at Warley Barracks (Essex) from the ranks of the existing (2nd) Reserve Battalion; and what was the establishment of the (2nd) Reserve Battalion became the 3rd (Reserve) Battalion. This pre-empted the restruction of the Guards Brigade(s) and the creation of the Guards Division commanded by Maj. Gen. Lortd Cavan. The existing 4th (Guards) Brigade, which included the 1st Irish Guards, was re-designated the 1st Guards Brigade and the new 2nd Guards Brigade included both of the newly ceated Guards Battalions. The Guards Division was then removed from the trenches to undergo training to fight as a division and to prepare for a large scale attack to break the German Line near Loos. On the 17th August, the 2nd Battalion Irish Guards left for France to join the 2nd Guards Brigade. As regiment when 2nd Battalion created and both attached to 1st & 2nd Brigades (respectively) of the (new) Guards Division. The Guards Division was at Maubeuge when the Armistice was announced and was later ordered to move across the Rhine and subsequently crossed the German frontier on 11th December 1918. The Division remained in Germany until the 20th February 1919 when its battalions began their return to England and the final moves of the Division were completed by 29th April 1919. The Irish Guards were not disbanded under the 1922 Anglo-Irish Agreement and continue in service today.